The Ultimate Reset is sometimes referred to as a "cleanse". But its truly more of a "Reset". It is based on clean eating and natural supplements to 1) help you lose weight. It is a 21 day program and will not have you chained to the toilet, like many unhealthy cleanses for force your insides and create undue stress. We are all designed to continuously and naturally remove toxins from the body. There are two kinds of toxins: water-soluble and fat-soluble. Water-soluble toxins are easily flushed out of the body via the blood and kidneys, but the fat-soluble toxins are a challenge for the body to remove. These fat-soluble toxins such as heavy metals, pesticides, preservatives, food additives, pollutants, plastics and other environmental chemicals must become water-soluble for the body to eliminate them fully. This happens mostly in the liver, but if our digestive and detox pathways are not functioning optimally, these toxins find their way from the liver to the blood, fat cells, and brain, where they can store for years, setting you up for health concerns down the road. This 21 day detox removes those fat soluble toxins that are in your fat cells (also keeping you fat), that can cause health problems, specifically, digestive disorders and cancers to name a few. This detox Im doing actually removes those toxins from the body. Losing weight or gaining just makes the fat cells bigger or smaller, but the toxins still are stored there. This detox eliminates them from the body to improve your overall health. Personally, I do the reset two times a year. Ive seen so many people have such positive results. As far as support, Im here to help you, as well as a privately run Beachbody sponsored Facebook group. These are results and comments from my own friends and clients. To learn more about the Reset, click here. I didn't do the Reset to lose weight. I did it for the experience. But I actually ended up losing 10 pounds anyway. I chose to put a few more back on after the reset was over. But its amazing that you can lose, even without trying. He said he would complete it, and HE DID! I am soooo PROUD of my husband, Neil Stanford for officially becoming an Beachbody Ultimate Reset GRADUATE! Im not sure whats more impressive, that he lost 21 pounds and is comfortably fitting in his size 33 jeans OR that he went 21 days without WINE, MEAT or CAFFEINE! What else? He says he feels noticeably more FOCUSED and has slept more soundly than he has in years. It's amazing how your body reacts when you fuel it well. 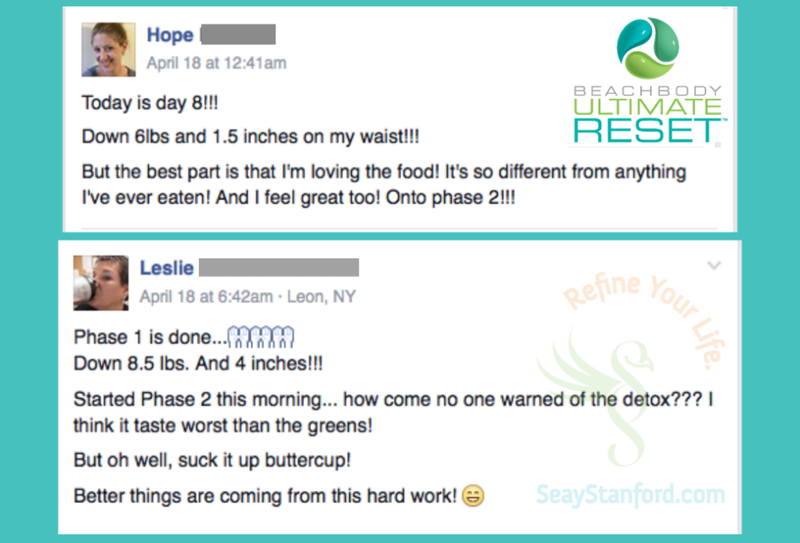 ANOTHER 21 day Reset Client Success Story! She lost 14 pounds! I will keep her identity anonymous because she is a Weight Watchers Leader. She was told by her doctor that she should consider a "cleanse" to get past her plateau. Ive done weight watchers in the past, and believe it is a good program, the only thing I feel it lacks is education on "Clean Eating" non-processed food choices. And what a difference THAT can make! Way to go girl! Im so proud of you! You did it!!! As someone who has been intimately involved with the creation of the Ultimate Reset, and has been monitoring this community since the launch of the UR, I felt it important to share this. So in the spirit of expanding your scope of the possibilities and take-aways while on the Ultimate Reset, I wanted to share something more with you. Below is a list of just some of the different “results” that I have cataloged.